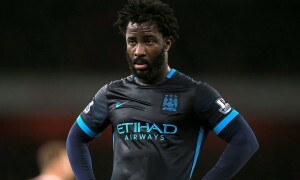 Wilfried Bony may have left Manchester City for Swansea on deadline day of the recent transfer window, but he has left the Etihad with a “what if” feeling after spending time with City boss Pep Guardiola. The 28-year-old returned to the Liberty Stadium in a £12million deal after scoring 11 goals in 46 appearances for City, with all of them during the tenure of Manuel Pellegrini. 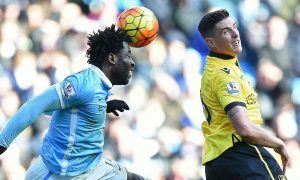 Could Bony have flourished more under Pep Guardiola? Given Guardiola’s style, one might think no, but the Ivorian believes he could have worked well with Pep. “Pep Guardiola is one the best coaches in the world,” Bony said during an interview. “Playing under him would have been something great. We had a good relationship. The most important thing for me now is to focus on my team, Swansea. I want to give the best of myself. “It was a bit difficult at the end. I had injuries. There were some good moments. We won the [League] Cup. The team reached the Champions League semi-finals, which the club had never done before. “For me, there were a lot of bad moments due to injuries. But there were also good moments in a period between October and December where I was going well until I was held back by injuries. Bony is expected to make his Swansea re-debut on Sunday when they play host to Newcastle United.